Japanese forest grass (Hakonechloa macra, also known as hakone grass or wind-combed grass) is a graceful, low-growing, deciduous true grass, with a mounding habit and green bamboolike foliage. Known as uraha gusa or fuchiso, it’s native to wet, rocky cliffs in the mountains of Honshu, Japan’s main island. This area includes Mt. Hakone – hence its genus name. Westerners are most familiar with the more colorful cultivars – ‘Aureola,’ with green & gold variegated leaves, and the golden ‘All Gold.’ However, the species plant, with its pure greenness, enhances the serenity of Japanese gardens. It’s planted in the Seattle Japanese Garden in Areas A (the Entry Courtyard) & C.
Hakone grass spreads slowly by creeping, horizontal rhizomes & stolons (underground & above-ground stems). The leaves are broadly linear. Although the leaf stems grow 12 to 24 inches long, they arch horizontally and appear shorter. The stems bend in only one direction, which gives forest grass a unique grace. Delicate inflorescences (flower clusters) appear between the leaves in mid to late summer. Hardy to USDA Zone 5 (minimum temperature -20 to -10 degrees F), Hakonechloa macra grows best in part shade, except in temperate climates like the Pacific Northwest, where it grows well in sun. It prefers moist, organic, well-drained soil & regular watering during dry periods, and is intolerant of waterlogging or salt spray. Another true grass, usually much taller, is Chinese silver grass (Miscanthus sinensus), also known as Japanese silver grass, maiden grass & eulalia. It’s native to low-lying areas in China, Japan, Taiwan and Korea. In Japan, it’s known as susuki. There are many cultivars (cultivated varieties, propagated by division, rather than seed), which differ in height, texture, summer & fall foliage color, flower color and cold-hardiness. Many are available at retail nurseries. The Seattle Japanese Garden’s cultivar is ‘Strictus’ (porcupine grass), with horizontal yellow bands that develop in June on the new green foliage. ‘Strictus’ resembles the very old cultivar ‘Zebrinus,’ known as zebra grass, but is much more upright in habit and doesn’t need staking. It’s planted in Areas T (next to the Azumaya) & ZZW (along the west side path, south of the orchard area). Hardy to USDA Zone 5 (minimum temperature -20 to -10 degrees F), porcupine grass grows in a dense clump, emerging from underground stems (rhizomes). It blooms in September when planted in sufficient sun -- reddish tassel-like flower clusters, held above the foliage, that mature to fluffy, silvery plumes. Although it prefers moisture and full sun, it tolerates dappled shade and some drought. Under ideal conditions, it reaches about 9 feet tall. Miscanthus is one of the “seven flowers of autumn,” late-flowering perennials cherished in Japan at summer’s end. Its flowering stalks are displayed in moon-viewing ceremonies that acknowledge the passing of the season. Traditionally, its stems were used for thatching, and to make the Narimono flutes used in Kagura dancing and sacred Shinto music. The other true grasses in the Seattle Japanese Garden are bamboos, which merit an article of their own. Ophiopogon is a genus of plants that look like grasses, although they’re not grasses at all, but rather are related to lilies, in the family Asparagaceae. Their delicate flowers & round fruits are very different from the flowers & fruits of true grasses. Common names include mondo grass, dwarf lilyturf, Japanese snakesbeard and Japanese hyacinth. Ophiopogon is native to Japan, China and the Korean peninsula. The genus name is from the Greek ophis (snake) and pogon (beard), indicating that the flower and its stalk resemble a “snake with a beard.” I find this resemblance rather difficult to visualize! The tuberous roots are edible and have been used in traditional Eastern medicine. 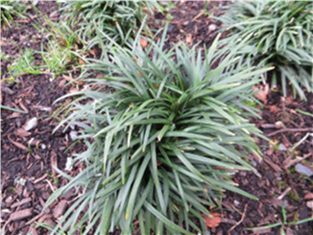 Dwarf mondo grass (Ophiopogon japonicus ‘Nanus’) is a miniature form, with very short (to about 2 inches tall), evergreen clumps of fine-textured, dark green foliage that emerge from an underground crown of tuberous roots. It spreads very slowly, but clumps planted closely together & allowed sufficient time to spread have the appearance of a mowed lawn. Dwarf mondo grass blooms more sparsely than other cultivars, with tiny light purplish flower spikes hidden in the foliage and small, round, dark blue fruits. It’s planted in our garden in Areas A, B & C.
Hardy to USDA Zone 6 (minimum temperature -10 to 0 degrees F), this very slow-growing perennial grows best in moist, well-drained, humus-rich soil in part or full shade. When established, it needs occasional watering during dry periods. Ophiopogon planiscapus is native to Japan’s wooded lowlands and foothills, but the green-leaved species is rarely planted or available. On the other hand, black mondo grass (O. planiscapus ‘Nigrescens’ -- also called ‘Arabicus’, ‘Ebony Knight’, & ‘Black Dragon’) is a popular and dramatic plant with green new growth that matures to purple-black. It’s planted together with low, spreading yews (Taxus) on the berm at the south end of the Entry Courtyard (Area A). The arching, straplike evergreen leaves emerge from tuberous roots in loose clumps, to 6-8 inches long. Pinkish-violet summer flowers appear among the foliage, and are followed by round, bluish-black fruits that persist through winter. Hardy to USDA Zone 6 (minimum temperature -10 to 0 degrees F), black mondo grass grows best in moist, humus-rich, well-drained soil in full sun to deep shade. However, if drainage is adequate, it tolerates less-than-ideal soils. Established plants need occasional watering in dry periods. The grasses and grasslike plants in the Seattle Japanese Garden aren’t notable for being especially showy – except for Miscanthus, with its tall stature and plumelike flowers. However, they add the element of movement to the garden, and their strap-like foliage creates a unique texture, unlike that of most woody or herbaceous (non-woody) plants. The arching foliage of porcupine grass and forest grass is boldly textured and moves easily in the wind, but even the low, fine-textured mondo grasses (“grasslike plants”) have arching leaves that hint at movement. All form a “living mulch” that covers the earth. The evergreen “grasslikes” form an unchanging living groundcover, while the deciduous true grasses reveal the transformations of growing and dying back, the inevitability of change throughout the seasons. For me, they’re a quiet reminder of Japan’s original religion, Shinto, with its ancient animistic beliefs: everything in the garden – plants, animals, stones -- is alive with the presence of the gods, known as kami.